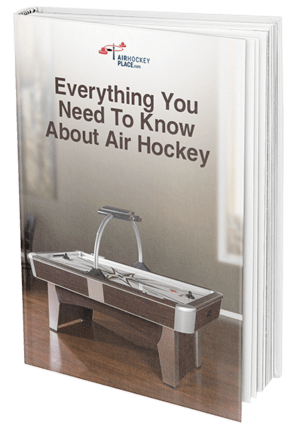 In this article, we will be giving our MD Sports Air Hockey Table review containing several options to choose from. Air Hockey is a very popular game with friends and family. The concept of Air Hockey is quite basic. Score more than your opponent. It makes for a great face-off game because you can see your opponent directly in front of you on the other side of the playing surface at any time. The excitement of the game is made possible by the intense action of the quick exchanges made with the puck on the playing surface. Neither you or your opponent holds the puck in their possession for very long at any time. You try to score, then your opponent tries to score, and sometimes one of you will get multiple opportunities to re-strike the puck with your paddle before the other one gets another chance. Being able to decide how, where, and when you angle a ricochet makes it that much more interesting. While there is a professional circuit of serious and competitive players, anyone can enjoy this great game. With there being so many brands and models, it can be somewhat overwhelming to figure out what the best options are for you. Today we will help you understand more about the brand MD Sports, and summarize some of their options. Here are four things you should think about when it comes to browsing and buying Air Hockey tables: size, features, mobility, and of course value. The following options have something different from one another. A couple of them are bigger than the others, and a couple of them are smaller than the others. There is one more geared toward younger children. There is even one designed for saving space in your game room. We hope the following information will give you a better idea of what there is to select from. The MD Sports Medal 48″ Air Hockey table is an enjoyable way to play the fun game of Air Hockey without having to go to the arcade. Great for hosting parties and gatherings, as well as encouraging your employees to relax and take a break. The Sports Medal Air Hockey table uses a special surface that is coated to ensure that the puck glides quickly and easily across it. The air power friction-reducing playing zone makes fast paced games enjoyable. This Air Hockey table comes with a manual score feature and an automatic score function so you can track the points the way that works better for you. All necessary parts and accessories for playing are included. The MD Sports Medal 24″ Air Hockey table is a good option for smaller areas and very young children. This Air Hockey table will give all the thrills of real Ice Hockey action for your kids. The high-quality gloss finish will help make sure the game doesn’t slow down. Each goal is equipped with manual scorekeeping to make it easy to know who is winning. Everything that is required for playing is included. The compact design of this table weighs about five pounds. Every young kid who likes hockey will enjoy this table. The MD Sports 42-inch Air Powered Air Hockey table is an excellent choice for people who want a solid compromise between space and surface area for playing. It allows more game room than other tables with its 42-inch table. The size of this Air Hockey table allows you to store and move it anytime. With the condensed design, you can enjoy Air Hockey nearly anywhere that has a flat surface. The 12V DC Motor comes with the necessary adapter for electric power and supplies consistent air flow for a realistic experience. Dual-score options, a manual method, and an electronic function are available for either preference. The MDF Hardwood frame increases its durability. All items necessary for playing come packaged. Everything needed for assembly is also included. The MD Sports 48” Alternative is a similar option to the first in our list. It comes with everything else the other one has, including the electronic and manual selections for scorekeeping. The graphic design on this one is a friendlier game room style. The graffiti texture really helps give that cool effect for a more fun atmosphere. All the kids in the neighborhood will go crazy for the MD Sports 36″ 4-in-1 Multi-Game Table! There is so much awesomeness packed into this option. The kids can go from playing Pinball Soccer to Target Shooting, to Archery and finally to Air Hockey. The 1/2″ leg design is reinforced to increase stability. The levelers make assembly an easy process and ensure that the table remains flat. You can convert between games with little effort.Everything that is needed to play comes with the table. That was our MD Sports Air Hockey table review. You should now have a better idea of their selection. Remember to keep in mind the four things we mentioned earlier in the article: size, features, mobility, and value. We like option 3 (MD Sports 42 Inch Air Power) and option 5 (MD Sports 4-in-1) the most. Option 3 gives you a good compromise between space and playable surface area. Option 5 gives you a lot for what you are paying for, considering all the different games you can play on it.